My family has been gone for the past 10 days on a trip that we’ve been planning for nearly a year. During the course of our trip, I had no email access and very limited social media. And I’m not going to lie…not being constantly connected was kind of amazing. I was more or less forced to “stop and smell the roses” and that turned out to be a good thing. And thankfully, I had time to reflect on a lot of things during the time we were away. There’s something about finally having down time plus the ocean to put me into a reflective mood. And as is often the case, I wasn’t too happy with what I figured out. It all started with a video my husband took of me and our youngest racing each other on the cruise ship’s water slides. I snapped a few screenshots of the video (because I figured no one would ever want to see the video but I might get a couple of good photos from it) and one of them startled me. 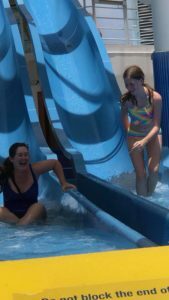 Abby and I had just hit the end of the racing water slides and we were laughing. Laughing with Abby after racing down the water slides. When I saw that photo, it hit me that I haven’t laughed like that in a while. A long while. And it also hit me that “vacation Annalisa” is really the best version of me that there is. And that maybe, even in regular old non-vacation life, that is the “me” that needs to be present, at least sometimes! Watching the waves roll by. The vacation version of me laughs a lot. So much so that my abs are sore from 10 days of laughter. Vacation Annalisa also takes time to enjoy the simple things: a good cup of coffee, sunshine, a breeze. Not to mention the fact that on vacation, I’m way more fully present with my family than I am the rest of the time—thanks in part to the aforementioned lack of Wi-Fi, but also because I’m actively choosing to spend time with them instead of doing other things. And now that I’m back home, I realize that my priorities have been out of whack for a while. It seems that I’m kind of the queen of biting off more than I can chew, and in the past I’ve always somehow managed to get everything done even if it meant making a lot of sacrifices. I think that was way easier when I was single! When I married Johnny 5 years ago, his kids were 8, 16, and 17. A lot has changed since then—for one, I no longer think of them as “his” kids but as ours. And that means I have a lot more responsibility than I did back then. While I realize I can’t be in vacation mode all the time, I do think there are changes that have to be made. I met Abby when she was 7 and became her stepmom when she was 8. Now she’s 13. I know these next years are going to zoom past. I don’t want her memories of me to be mainly of me being stressed out over work and writing. Which means I have to figure out some ways to simplify my life. I have to figure out how to get rid of some of my stress and how to manage my time and responsibilities so that I have more time for my family. Because these years are precious and fleeting. Anyone have any tips on time management? I’d love to hear! And as a side note, to those of you who are waiting for the release of A Reservation for Romance, I apologize. It’s not quite ready, but I’m back at it this week, trying to get it done. Thanks for your patience with me as you wait—I’m doing the best I can to get it to you quickly. Sign up for my newsletter to receive a notice when it releases! I’ve been killing around in the Danish concept of hyyge. It’s lovely! A radical lifestyle change for us Americans…it’s not so much managing your time as on- purpose carving out cozy moments alone and/or with others, being really present. It’s prioritizing happy experiences. I like that concept! Carving out moments on purpose and being present are things I need to work on! Hi Annalisa! Thanks for sharing your experience. As a mom of three and grandmother of four, I cannot imagine being an instant mom of three, especially two teenagers. That is a gigantic learning curve in the parenting department. My prayers are with you and I believe you manage well. Nice that you were able to have a vacation and step back to access your life. The best time management / stress reducing tip I ever received as a young mom, pastor’s wife, and teacher was to make a to do list / prioritize the list / and only tackle ONE TASK at a time. This tip kept my sanity during the sandwich years when I was working full time as a pastor’s wife with three kids (two teens and an elementary school age). Every Sunday night I made a weekly plan with appointments, obligations, and things I wanted to accomplish. Then in the morning, before my kids got up I reviewed the day’s plan – appointments, lessons, obligations vs. other tasks that I could let slide if need be. This kept me focused and on task without feeling overwhelmed. I started my day early (an hour before the family awoke) to have some quiet time to myself. As a family, we tried to have dinner together every night. Friday night was family night with a movie and pizza. Downtime for this pastor’s family. Now as a grandmother, I watch my 4 grandkids (ages 13, 10, almost 5, and 19 months old) four days a week, I try to make memories with them. Laugh, tease, read, play games, and make their favorite foods. 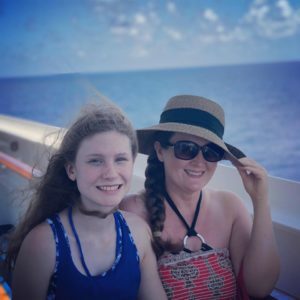 Hi Annalisa- how lovely that you could get away and relax with your family:) I work full time and have two boys so empathise with your reflection- and want to ensure that my family don’t just get the ‘leftovers’ of me! I think this is a work in progress for us…but I keep remembering that I only have my boys for such a short time (before they get all grown up!) so being deliberate in doing things together. You are wise to enjoy the fleeting time. We had pizza and movie night on Fridays as the kids were growing up. Making lists and prioritizing is a good suggestion. What doesn’t get done, can get done another day , or be skipped altogether. My husband used to tell me , “Just say no!” We were very busy in our local church and at home. I did in home daycare for30 plus years. I home schooled our youngest as well. Its tricky discerning where the Lord wants you to minister when there are needs everywhere. I learned to pare down volunteering to manageable proportions . We moved to be nearer our kids. Fortunately for us they all live within an hour and a half of each other. I’m enjoying helping with grandkids and finally have time for sewing. Lord bless your time! Diane, the just say NO is difficult to learn when the spirit is willing and the need is great. Before I retired from teaching, I remember helping a colleague. She had been my student, was the age of my children, and contemplating marriage. She taught, tutored and was on several church boards. She was feeling burnout and was stressed. While driving to an English conference, I had her practice saying NO. She is still teaching. Told her to practice NO in font of the mirror daily. Making lists also helped me discover what I hated doing on a weekly basis and so I eliminated those commitments over time – severing on boards or publishing newsletters. Enjoy your grandkids. prayers for wisdom for you. i had a similar personal look into myself. my final result was to cut some things out of my life and not say “yes” as often as I did. this freed me up for more time with my family. it made a huge difference in our family life. and yes our little ones are with us such a short time. i am so glad i made this decision. helped me put perspective into my life, therefore into my families life. best to you and yours. Prayers for you, Annalisa, and managing all that you do! It’s not easy, but like they say, if it was – everyone would be doing it. Bless you for the sacrifices you make everyday! Your writing is wonderful and so appreciated by us all! I’m glad you were able to unplug! I did that many years ago right after I was first published and it was the best thing I could have done for myself. My to-do list will be there when I can get to it–this attitude is new for me and a huge step. I hate having things hanging over me. I also, work hard at not over committing and knowing my limits. Thanks, Kimberly! (and thanks for responding in spite of your long list!) I think giving myself permission to only do the “musts” and ignore the rest until I can get to them is a great idea. And I sure have to work harder at not over-committing! I’ve got nothing, Annalisa. I do make my family my priority and only write when they’re not home or sleeping. But I’m blessed to be a full time writer. I don’t how authors with full time jobs do it, so my hat’s off to you. Annalisa, as a mom of 5 (adults now), and a teacher and, and life often seemed overwhelming. I found lists and budgets added to my stress. I tried to do what needed to be done each day, to only buy essential groceries and to laugh with my boys. I love your vacation pictures. Taking the boys to the beach or on trips was always fun. Hopefully those times of laughter will be more memorable than those days when I was stressed and nagging them. Now I try to be available for grandchildren but not say yes to too many obligations. Thank you so much for the back to school bash it is awesome! I love reading paperback books! Great blog! Don’t know how you do it all!